This is an excellent watch in the sportura series. 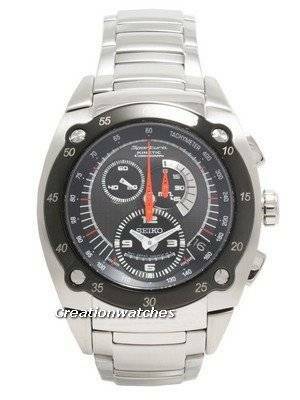 Seiko Sportura watches came in kinetic movements. Seiko kinetic movement propels the hands and the various functions by converting energy from the wearer’s bodily movements. An additional elaboration on the kinetic movement includes a self-regulating mechanism that stops the hands when the watch is left unused for a long period of time, but keeps track of time inside the caliber. When moved again, the watch automatically resets itself to the current time, and continues to run as if nothing happened! 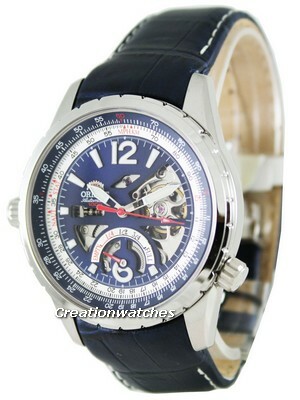 It is an analogue quartz watch equipped with an Automatic Generating System developed by SEIKO. It generates the electric energy to power the watch, utilizing the movement of the arm, and stores it in the Kinetic Electricity Storage Unit (KINETIC E.S.U. ), which requires no periodical replacement unlike conventional button-type batteries. The black dial is very sporty finish color orange feed. Body and case are stainless steel made. Dial is showing luminous hands and markers while the outer edge is showing tachymeter. A date window is between 4 and 5 o’clock. At 6 o’clock time direction indicator is present. Sportura Kinetic Chronograph is the ultimate in sports timing. Bracelet is folded by push-button deployment clasp. Bezel is covered by metallic black tungsten. Seiko Sportura includes chronographs of all kinds and sorts, a tachymeter, an alarm, power reserve, and a set of inner functions such as the overcharge preventer. This watch has an energy depletion forewarning function. When the second hand starts moving at two-second intervals instead of the normal one second intervals, the watch will run down in approximately 12 hours. The watch remains accurate even while the second hand is moving at two-second intervals. The stopwatch of this watch can measure up to up to 45 minutes in 1/5 second increments. Additionally, the watches were cast of stainless steel with an added durability factor (high-graded), and equipped with an anti-glare sapphire crystal. Overall, the watch is very nice looking and captures the F1 theme well.